For those office workers who rely on the roasted bean as their method of waking up every morning, there are plenty of places to get your caffeine fix, especially due to the rise in popularity of artisanal coffee brewing methods. You can choose from many coffee shops in Cape Town to find the perfect cup of coffee. You might enjoy the warm and welcoming familiarity of Mugg & Bean in Century City or you may want to try something a little different at The Good Batch coffee shop and deli in Canal Walk. For those who want to give back while enjoying their daily grind, you can opt for the ever-popular (and the cheapest place to buy coffee in the Mother City) Xpresso where you can purchase vouchers for those in need of a hot drink and a cheap meal. 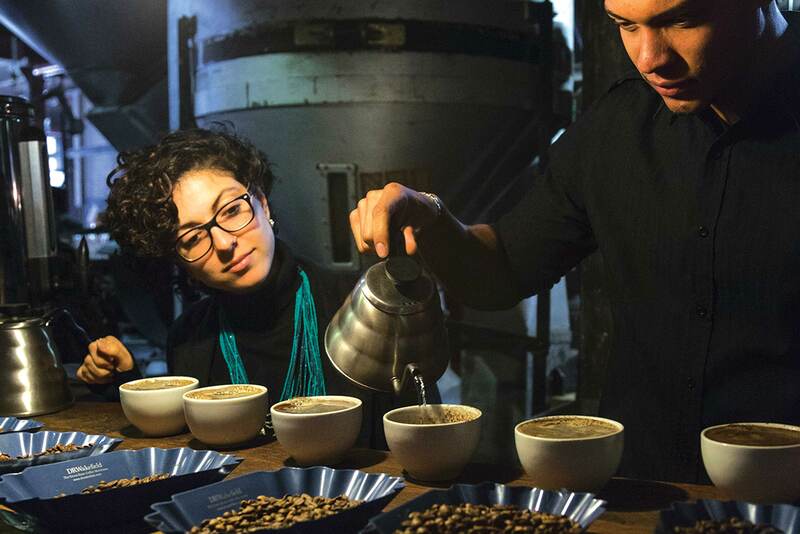 Read on below for some interesting information on Cape Town’s blossoming coffee culture. So, what is coffee culture? Coffee culture can be understood as coffee-related social interactions and the enjoyment of coffee in settings such as coffee shops or cafés. It’s popular among everyone who enjoys a well-made cup of Joe but even more so among young office workers. Coffee houses date as far back in history as the 14th century, when coffee houses in Turkey were considered to be artistic and intellectual hubs. Today, cafés aim to mimic this setting and atmosphere, being decorated with unique wall art, providing Wi-Fi and a quiet place to sit and work or to connect with friends. It’s easy to see why coffee culture has become so popular with office workers, especially when the days become stressful and people need a way to relax and unwind. Many cafés offer quiet working spaces or have collaborated with offices to offer these workers access to the coffee shop during working hours when they need a break from the hustle and bustle. How has it grown in Cape Town? Cape Town is known as being a cosmopolitan city, so it stands to reason that it would become coffee central for those living in the Western Cape. Not only are there unique cafés on each street corner selling quirky and delicious concoctions (turmeric latte anyone? ), but there are more and more coffee shops opening in malls such as Canal Walk. Here you will find shops such as Sweetbeet and Seattle Coffee, each one offering a different experience to coffee connoisseurs. Baristas are trained professionals and respected artisans, which is a dramatic change from the days when making coffee for a living was seen more as a side job and not really taken seriously as a career path. With bean-to-cup culture growing so rapidly, more and more offices are investing in these machines to create impressive coffee creations to add a little spring to the step of their workers. Not only has coffee become the go-to beverage for social gatherings with friends, but it has also become the drink of choice for many meetings, networking events and day-to-day office life. Many coffee shops in Cape Town are often filled with office workers who stop off during lunch hours for a gourmet caffeine fix, while some are prime meeting places for interviews and business deals. Now, not every coffee shop is as iconic as Central Perk (cue the Friends theme song) but three are many in Cape Town which have the same popularity status among office workers due to their outstanding offerings and relaxing atmospheres. Studies have found that people are more productive in spaces where there is ambient noise, like the conversations that take place in coffee shops. Workers don’t need to stop their work to pay attention to these conversations as they would have to do in the office, as any conversation could be important. The coffee shop setting is also more conducive to creativity, as an open plan office might make employees feel as though their every move is being watched. But in a coffee shop, workers can focus on their tasks and be more creative without having to worry about other happenings in the office. So, if you want a workforce that is more productive and creative, invest in building a relationship with a coffee shop so that your workers can spend time there. You should ensure that your office has a high-quality coffee machine if you are based far away from any coffee shops, or you could have a day where employees can work from home or a local café to build morale and encourage their love of the daily grind.